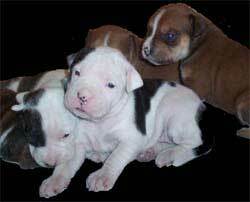 The Banter Bulldogge is a strong, mid-sized working dog, muscular and athletic of a Bulldogge/Mastiff type with minimal white. "To banter" means "to address in a witty and teasing manner. Good-natured and usually witty and animated joking". 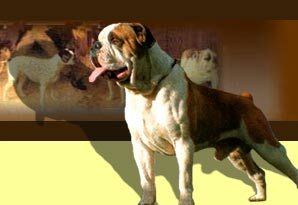 Todd Tripp, who created the banter bulldogge in Southeast Ohio in the late 1990's considered that this definition perfectly fitted the description of the temperament of his breed. 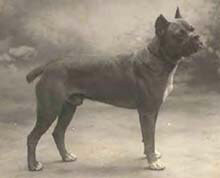 It is also widely known that the Brabanter carried very little if any white until the 1830's when the English type Bulldogge was first imported into Germany. The fact that the term "banter" remembered this Brabanter origin further decided Mr. Tripp to coin the breed "Banter Bulldogge". A great deal of research, consistency and selective breeding was involved before he reached his final goal. 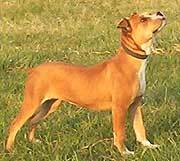 The Banter Bulldogge's foundation dogs consisted thus of Boxers (the descendant of the Brabanter Bullenbeiser) and of various working bull breeds. 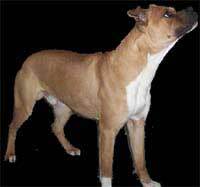 Mr. Tripp regularly infused a high percentage of Boxer in his breeding program and was very selective in choosing dogs close to the model he had fixed himself. Banter Bulldogge is athletic and very capable of many of today's canine sports such as weight pull, agility and personal protection. They are easy to train and very obedient. However Banter dogs do need to get a good workout or energy can become built up. They must be loyal, great with children and never overly human aggressive but yet cautious of strangers. 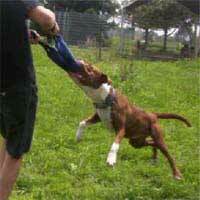 They are a ruff and tuff dog playing and are fine with other dogs as long as they have been properly socialized. 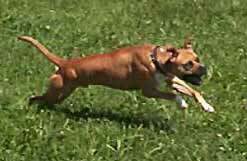 A fun dog with its family always eager for play time and is smart enough to know when play time is over. The Banter Bulldogge is IOEBA registered. It is a good watchdog and will bark to alarm danger or to scare off trespassers. Will be steady to protect if necessary. They have a lower energy level indoors than out. Bulldog Information 2003-2006 © All rights reserved. The Bulldog Information Library 2003-2005 © All rights reserved. Original idea, design and development by C. Marien-de Luca. No part of bulldoginformation.com may be copied, distributed, printed or reproduced on another website without the owner's written permission. Please feel free to link from your site to any of the pages on this website in a non-frame presentation only.